It’s a given that teachers are active on social media. We showed you the top posts they engaged with last year, reported educator-related social media trends in the 2018 MDR Digital Trends in the Education Market report, and provided tips for social marketing in this webinar. 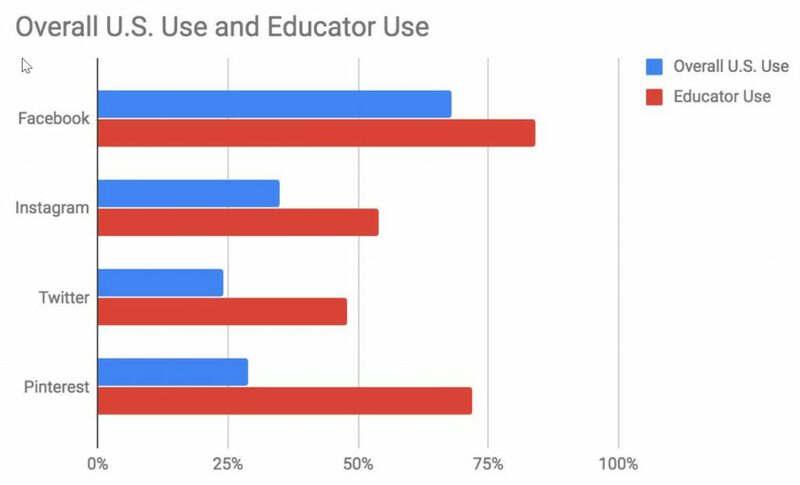 We recently dug a little deeper on the topic and surveyed teachers about their social media preferences. * Here are a few of the responses that challenged our assumptions. We thought you might be surprised as well. Millennials and social media. Social media and millennials. It seems that joining the two terms together is practically required by law. I have to admit, I was certain that nearly all the survey respondents would skew toward early career. As it turns out, while there was a significant millennial presence among respondents, with 41% reporting 1-10 years of experience, the majority – 59% – have been teaching more than 11 years. In fact, a whopping 42% have been teaching 16 or more years! Teachers of all experience levels are using social media, and veteran teachers appear to be heavier users than those who are new to the profession. The lesson for marketers is not to ignore more senior level teachers. Rather, craft your content with your target audience and their experience level in mind. Not surprisingly, teachers report heavy use of Facebook. In fact, 83% of our respondents said they use Facebook, followed by 72% who use Pinterest, 54% who use Instagram, and 48% who use Twitter. However, when it comes to the channels they favor for work, 74% of respondents said their number 1 social media channel is Pinterest. Facebook was next (39%), followed by Twitter (30%), and Instagram (17%). And what are teachers actually looking for on social media? Here’s what they told us. Educators hunt for ideas, information and deals on social media. And they’re not only on Facebook! It’s crucial to understand how each social channel works and share content that is germane to each. Post creative ideas that teachers can use in their classrooms like lesson plans, demonstration videos, classroom decorating ideas, downloadable activities and posters. Run sweepstakes and contests. Provide professional development opportunities that they can take part in online. And remember, teachers spend a lot of their own money for their students – offer them discounts and deals that help them save their hard-earned money. Teachers don’t just sit back and wait for marketers to dazzle them. They are scouring the web and social for the products, services, content and resources they need. Growing your brand’s presence online will enable them to find you. Teaming with trusted partners in an established community will help you win their confidence. A brand can establish themselves as teacher advocates by sharing valuable content within a brand-neutral ecosystem. Teachers of all ages and experience levels are active on social media. Their use of social is not limited to Facebook – they love Pinterest, and are active on Twitter and Instagram as well. Teachers search social media to find content and resources for their classrooms, interact with other educators, enhance their own skills, and shop for deals. It’s important for marketers to know which social platforms teachers are using, for which purposes, and create content that is appropriate to the platform. To help you better engage and interact with teachers on social media, follow the steps we outlined in this checklist or contact us to talk more about ConnectED Reach Social Marketing services. **Teachers were asked to select all that apply; these were the top subjects by percentage. P.S. With 2.7 million followers and nearly 300 social media views million each month, WeAreTeachers is one of the premier online educator communities in the country. Teachers look to WeAreTeachers for advocacy, insight into top issues affecting educators, uplifting and humorous posts, support from their peers, and resources shared by corporate partners.